The moment you walk into Beaches Negril, you officially enter a carefree zone. Negril is the place where "laid back" was invented, and that vibe is totally contagious. Before long, you'll be footloose and cheerful in a paradise where everything is included. When you're located on the widest stretch of Negril's famous 7-mile Beach, the best place to be is at the water's edge. That's why we've even put a waterpark there. Everything you can possibly imagine is beachside at Beaches Negril — from lively pools to restaurants and bars. Seek adventure, relax, or do both. It's all about spending time with those you love... any way you want. Negril's Seven-Mile Beach has been voted many times over as one of the best in the world, known for its dramatic sunsets, silky white sands, clear turquoise waters, and spontaneous island spirit. 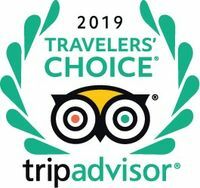 It’s no wonder it was voted Trip Advisor’s® Travelers’ Choice Top 25 Beaches in the World for the second year in a row. 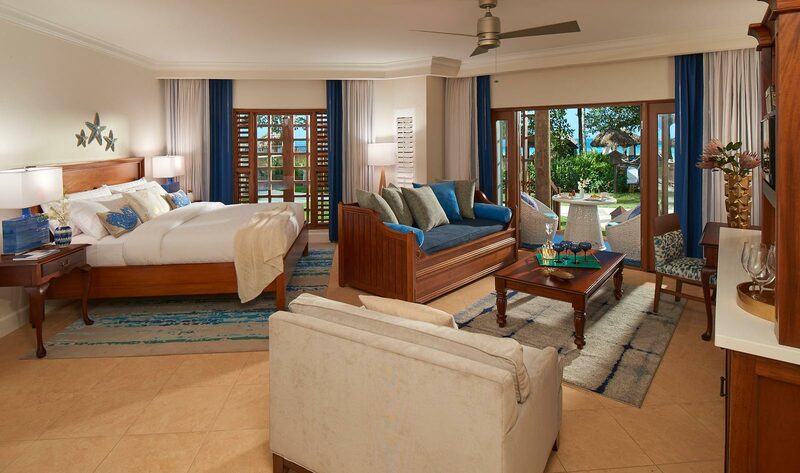 Our exclusive Suite Concierge Service is a Beaches Signature amenity included for all Concierge level rooms and suites. The inclusions are the same as our Luxury rooms, plus mahogany four-poster beds, sitting areas, full bath, in-room bar (fully stocked) and his & her robes. 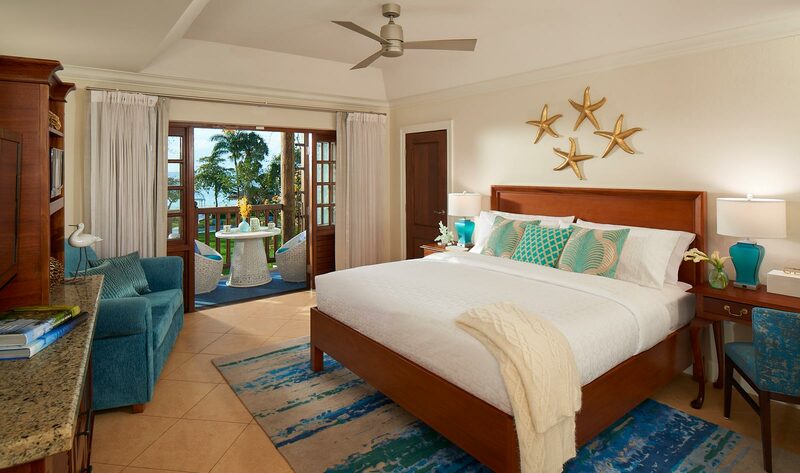 We've designed these one-of-a-kind accommodations with both couples and families in mind. Our Beaches exclusive Together Nest Suites® feature thoughtfully selected details, world-class amenities and personal butler or concierge service for the ultimate get together getaway. Where will you eat tonight? Food lovers of all ages will enjoy nine world-class gourmet restaurants featuring the distinctive flavors of Italy, Mexico, America, France, the Caribbean, and more. Plus, you can finish off the evening with a delicious frozen yogurt at Yoyo’s. Spread out over a lushly landscaped 20 acres, Beaches Negril epitomizes paradise with spectacular gardens beside the sea, a sprawling Pirates Island waterpark, and plenty of activities and amenities for the whole family. The ocean is your playground with watersports and scuba diving. Only Beaches all-inclusive Caribbean resorts offer the most comprehensive resort diving program, and best of all, it's all included. Our exclusive partnership with Sesame Street® makes Beaches the only caribbean resorts where kids can play every day with the lovable, colorful and friendly characters! At Beaches, we give kids extra attention with tailor-made fun just for them, offering age-appropriate activities for kids of all ages, from tots to teens. They're always supervised. In the Xbox Play Lounge, guests of all ages can enjoy unlimited free play! Test your skills, play with friends or challenge your own family on a variety of Xbox games - from racing and sports to adventure and fun, there's sure to be a game for everyone to enjoy! The sleek new hotspot gives tweens and teens another a great place to make new friends and one more reason to brag about their Beaches Resorts vacation. Adults take over later at night, when the champagne bottles are uncorked and premium spirits are poured.